Please welcome Abbey to our Britannia Farms team! This beautiful AKC apricot colored Standard Poodle is a future Mother for our Goldendoodle breeding program. Abbey weighs 47lbs. Abbey has passed OFA preliminary hips and elbows, she is also clear on OFA heart and eyes. Genetic testing through Embark showed Abbey is clear/negative on all 172 genetic tests they do including diseases common in Poodles, VWF, prcd, DM, MH, CM, NEwS, MAC, OC and GM2. This is wonderful news! 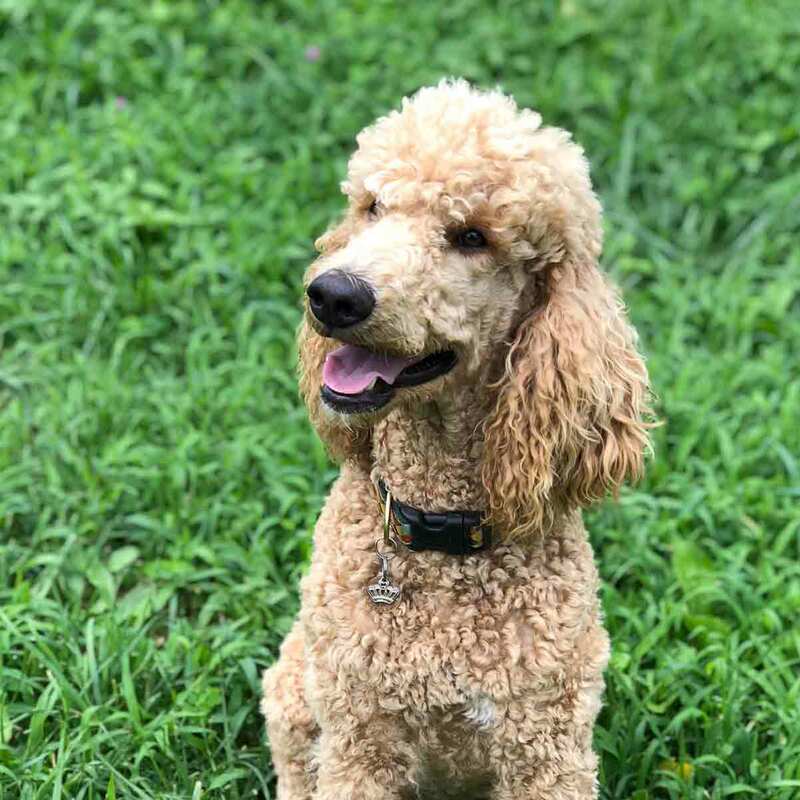 Cha-Chi is 3 years old, a CKC registered white standard Poodle, on the smaller side weighing 45lbs. Submissive and sweet as can be, a little shy but loves her family. She also loves to play outside and run with Ruby, her best friend here at Britannia Farms. Cha-Chi is OFA Good on hips and clear on elbows, and OFA heart and eyes are clear. Cha-Chi’s first litter of Teddy Bear Goldendoodles with Tsar were heart melting, and her second litter with Martin were equally delightful. She has proved herself as an excellent and attentive Mother. ‘Harlow’ is imported from Ukraine, of Finnish descent. She is 3 year old, with a thick cream coat and blocky head, and a beautiful expression. Harlow is our biggest female Retriever at around 90bs. She has a soft and submissive temperament, with a super affectionate personality. She is all about her humans! Harlow has passed health testing on hips, elbows, heart and eyes, she is PRA-1/PRA-2 neg, MD neg, Thyroid clear and ICT affected status. Harlow made some stunning puppies for us, and was an equally good Mother.